Really beautiful. Love this bird. So beautiful and festive, Pam! I love the colors and the resist you created with the icicles. Great showcase of these stamps, powders and dies! Happy Thanksgiving to you and your family! Just Wow! Such beautiful colors, especially love the details inside...well and outside too! Great job and thanks for sharing! Your journal is so beautiful! Love all the textures! Fantastic journal - I love it! So festive and beautiful! Love the colors and embossing! Gorgeous colors and dimension! Love that beautiful holly image! Great presentation showcasing Emerald Creek stamps. Gotta love that wrapped journal die. I need that wrap die to create while playing in Florida at the Saturday SB mornings. Pam this is amazing. I think my favourite is the Amber icicles. I might use that on some of my holiday projects. Just brilliant. Wow, gorgeous journal. Thanks so much for the tutorial.I love the icicles! Lovejournal and beautifully presented. Thanks for sharing. Very nice love the stencils you used throughout! Pam I think this has be one of my all time favourites of your projects - the clever glistening stamping on the pages and cover teamed with the verdigris effect mix of inks and that incredible wreath around the cardinal. LOVE it all!!!! Such a gorgeous journal Pam! Love the bright colors you used. Thanks for sharing with us. Beautiful journal ! 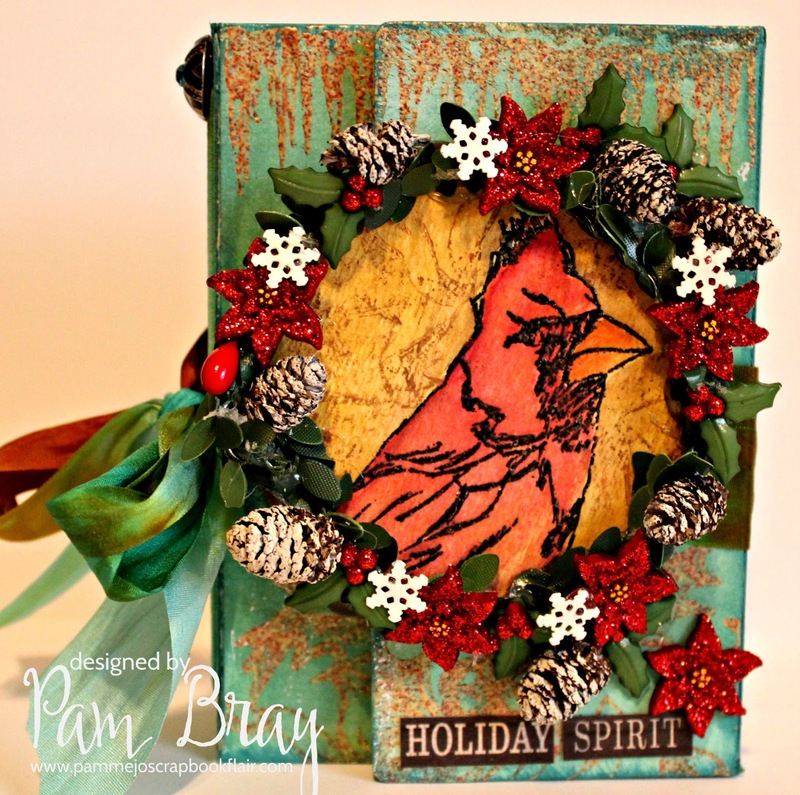 Love the mix of colors and EP, the stamps used and that wreath is top ! Love the bird and wreath! Beautiful! Love how you used the fabulous Emerald Creek stamps and powders. It is truly magical. Beautiful project! I especially love the cardinal! I want this! So gorgeous! The perfect journal for capturing Christmas memories!